ICANN has developed a gTLD Registry Continuity Framework in collaboration with experienced gTLD, ccTLD registries and members of the technical community. to ensure confidence in the DNS. 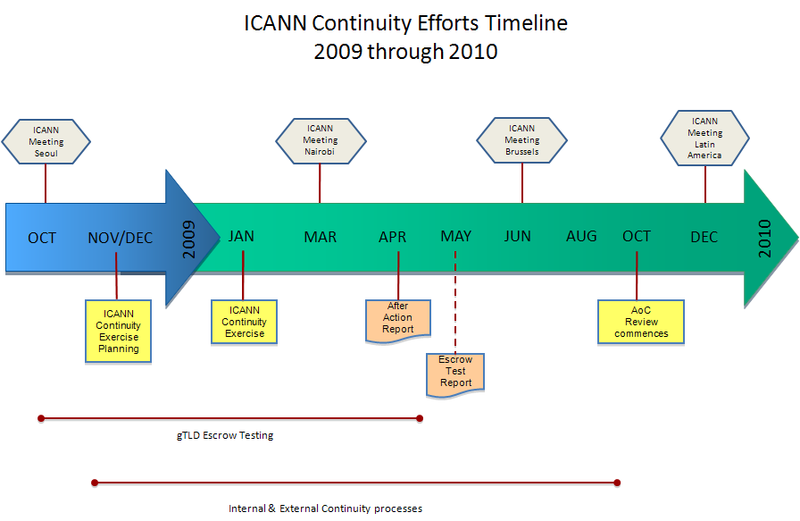 Since late 2009, ICANN has been updating the gTLD Registry Continuity Plan into a framework based on recognized international standards for business continuity. The framework is an internal process for contingencies involving gTLD registries, and is part of overall ICANN Business Continuity efforts. ICANN has also been testing gTLD registry data escrow with escrow agents and several gTLD registries. Testing results will be reported later in the year. ICANN has updated the gTLD Registry Continuity Plan [PDF, 96K] to be consistent with current terminology in the draft Applicant Guidebook for the new gTLD process and following the Joint ICANN-gTLD Registry Continuity Exercise conducted on 28 January 2009. The implementation procedures for the gTLD Registry Continuity Plan will be posted on this page in the near future. For further information on ICANN activities in this area, please see the document archive.